Often referred to as where the Mediterranean meets the outback, Mildura is a perfect place to indulge in the best of cosmopolitan hospitality with the easy-going personality a major regional centre. Alive with lush green golf courses, citrus groves and vineyards, endless sunshine and sandy river beaches, Mildura and its surrounding towns have an unmistakable flavour of a diverse society. City sidewalk cafes and precincts of contemporary restaurants constantly surprise dedicated foodies with their innovative fare, fresh local produce, plus premium wines and beers. While in Mildura, taste locally brewed beers at the Mildura Brewery Pub, a state-of-the-art working boutique brewery on full display as patrons enjoy their generous pub fare. If you're looking for a great river pub, head across the Chaffey Bridge to the Gol Gol Hotel. Mildura and the surrounding towns of Red Cliffs, Irymple, Merbein, Gol Gol, and Buronga have an unmistakable cosmopolitan flavour thanks to a multicultural society. Mouth watering local foods and wines, a healthy arts culture and a busy year round calendar of events are on offer here. The arts have always been a serious business in Mildura with an eclectic array of theatre, dance, music, literature and visual arts programs on offer throughout the year. Celebrate and enjoy gourmet weekends of Jazz, Food & Wine or fine music featuring outstanding Australian and Italian musicians performing for a community that loves to celebrate. Touring the area with a local will make all the difference. Selections range from guided Farm Gate tours, Wine & Dine tours along with full day tours to the World Heritage Listed Willandra Lakes system and Mungo National Park. A must visit when in the region as Mungo is the oldest known archeological site for man’s occupation of Australia dating back around 40,000 years. Mungo National Park Tours can be taken from Mungo Lodge and give you a wonderful indigenous experience and story. Alternatively, hire a bicycle and take the bike track along the river to Apex Park, or learn how Mildura became Australia’s first irrigation colony and trace the developments of Mildura through the Chaffey Trail, a series of walking tracks and driving routes with stop offs at Mildura’s founders, the Chaffey Brothers’ historic Rio Vista House and the impressive new Mildura Arts Centre for a unique cultural experience. You can always walk the Art Deco Walking Tour. Central to Mildura’s appeal is an excellent range of apartments, hotels and unique B&B accommodation in the city heart allowing guests to stroll amid the modern shopping and restaurant district. Visitors staying on luxury houseboats can moor close to the action, just a five minute walk to the city centre allowing a perfect position to browse riverbank produce stalls at the Saturday farmers markets held twice a month. 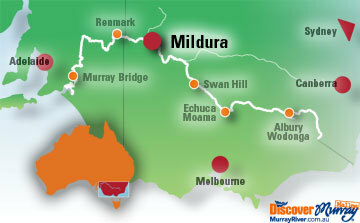 Many excellent caravan parks also flank Mildura city and prime riverbank locations. Renowned for its contribution to the nation’s wine industry Mildura is synonymous for its many award-winning vintages. Trentham Estate Winery and restaurant with its panoramic views over the Murray River, historic Chateau Mildura Winery or boutique estates Oak Valley and Nursery Ridge wines offer a rich assortment of choice, as does the new Sunraysia Cellar Door where you can sample some 250 wines from more than 20 local producers. For a variety of water-based activities on Mildura’s stretch of the Murray River, take a luncheon cruise on Paddle Steamer Melbourne, go canoeing with Wild Side Outdoors, stand-up paddling or hire a run-about - tinny and cruise upstream to the award winning Gol Gol Hotel. As one of Australia’s most picturesque and diverse regions in which to swing a golf club Mildura and surrounds is home to many top golf courses where everyone from professionals to weekend enthusiasts enjoy the fantastic choice of distinctive places to play. Check out what the locals love to do in Mildura! Discover Mildura's great and unique Australian history! Enjoy hospitality and warmth while staying in comfort at your choice of accommodation. Make the most of the cosmopolitan atmosphere and hospitability with spectacular scenery of the Mildura region. In the city of Mildura, many venues are within walking distance to the town centre, however for those keen to get away from it all, there are a number of accommodation venues located further out in locations in wonderful parts of the region.